Trigger warning: Both books mentioned deal with heavy topics, violence, sexual themes, and depression/suicide. Please be forewarned before reading this review or reading the books. Once upon a time, I was a girl who swore she would never like zombies. I swore I would never watch The Walking Dead. I was staunchly against anything that would potentially scare me, and I was determined to stick to consuming tame media that wouldn't terrify me. Fast forward to the future. The year is 2016. After The Walking Dead's season 6 finale (and terrible cliffhanger), I am waiting for TWD to return this fall. I am also voraciously reading YA books. These two things combine admirably when I find a book on Goodreads called This Is Not a Test by Courtney Summers. A novel about zombies? Hey, why not? Not sure what to expect, I begin reading. The first chapter captures me heart and soul. 326 pages later, I am obsessed. It's the end of the world. Six students have taken cover in Cortege High but shelter is little comfort when the dead outside won't stop pounding on the doors. One bite is all it takes to kill a person and bring them back as a monstrous version of their former self. To Sloane Price, that doesn't sound so bad. Six months ago, her world collapsed and since then, she's failed to find a reason to keep going. Now seems like the perfect time to give up. As Sloane eagerly waits for the barricades to fall, she's forced to witness the apocalypse through the eyes of five people who actually want to live. But as the days crawl by, the motivations for survival change in startling ways and soon the group's fate is determined less and less by what's happening outside and more and more by the unpredictable and violent bids for life—and death—inside. When everything is gone, what do you hold on to? This Is Not a Test revolves around the zombie apocalypse and the six teenagers who find themselves stuck in it. Sloane, Cary, Rhys, Harrison, Trace, and Grace have barricaded themselves inside their former high school with only one goal: survive. The only problem is that Sloane, who narrates the book, doesn't want to survive. Before the apocalypse, her life was awful. Zombies -- aka "the infected"-- only exacerbate that problem. Sloane doesn't want to survive -- she wants a way out. And with the dead roaming the streets, that may be easier to accomplish than she thought. However, being trapped behind the walls with five other teens still makes it difficult for Sloane to accomplish her goal. Torn between surviving and disappearing, Sloane deals with emotional perils and physical ones as the dead surround the school, desperate to get in and get a taste of human life. Between her struggle to keep going and the infected who want her to die, Sloane struggles with choices and emotions, hanging in limbo, much like the infected, between life and death. This Is Not a Test grabbed me, hooked me, then ripped my heart out (not unlike the infected that haunt this book). It's an interesting morality study on what makes a human life valuable and what choices one makes when their life is on the line. Some of the characters do pretty terrible things in the wake of the infected, and while their actions are appalling, the book also forces you to ask yourself whether you would do the same thing if you were in the zombie apocalypse. The answers aren't black and white; instead, they're gray, which makes this book all the more intriguing. It's filled with tension--even though there aren't very many zombie-human battles, there's always an ever-looming sense of danger and fear that's expertly written and kept me on the edge of my seat. In the last few pages, my mind was spinning and my heart racing as everything rose to a fever-pitch of Absolutely Awful. This Is Not a Test is an exciting, terrifying book. These books are similar to The Walking Dead in their atmosphere, their questions about morality, and their absolute chilling content. In fact, I'd say this is TWD in book form except with a more adolescent twist. (Imagine TWD being solely focused on Carl, Enid, and their friends, and you wouldn't be far off.) Even for people who aren't fans of TWD, This Is Not a Test is a good book to read to give you a taste of the zombie genre. 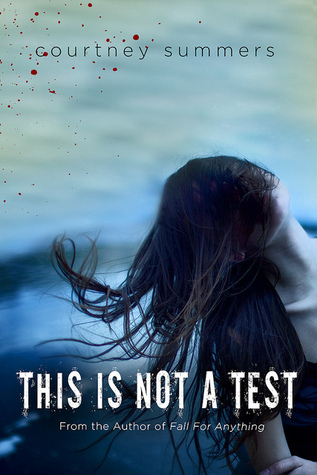 So if you're looking for something to tide you over while The Walking Dead is on break or you're looking for a read to keep you on the edge of your seat and make you feel all the feels, I highly recommend the This Is Not a Test series by Courtney Summers. In the meantime, you can find me desperately wishing for another book of this series that's quickly risen to the top of my favorites list. I love these books... and I guess you could even say I've been infected. Have you read the This Is Not a Test series? Do you have any other zombie YA book recs? Wow. I don't watch TWD but I'm a sucker for zombie books/movies. :) And I love books where it's more grey instead of black and white... Sounds like these are going on my "to read" list!